To arrange your own play-day around your child’s school schedule, email us. Dates in BLACK have space available. Dates in RED are full or no longer available. After care may be available from 3:30p-5:30p if there is demand. *A $25 registration fee will be charged with each registration. This fee will cover registration for all 2019 programs. Participants who have previously paid the 2019 registration fee will have any additional registration fees applied to their account upon payment of the remaining balance. In the case of rain day(s), refunds will be issued for each day, or portion thereof, cancelled. For detailed refund information see the refund policy on your confirmation form. This sample schedule is to give an idea of the timing and logistics for one age group on a typical day. Each age group participates in a different sport on a different field/court. 12:00p - 12:45p Lunch for full-day campers. Afternoon campers arrive/walk to fields. Our Play-Days run when school doesn’t! In our all-sport program your child will play a variety of games throughout the day or, if you prefer, you can put a group together and request a day of their favorite sport(s). During the Winter Season, indoor activities and/or ice skating may be included in the schedule for an additional fee. We can set up a program for your group any time school is out whether it’s a national holiday or simply a day off for teacher conferences etc. Email us to request a day of activity for your child’s class!  Our coaches consist of current and former college and professional athletes who love their sports and love working with children of all ages and abilities. 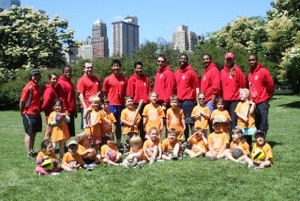 We meet on the East side at the playground on 72nd and 5th and on the West side inside 67th and CPW. 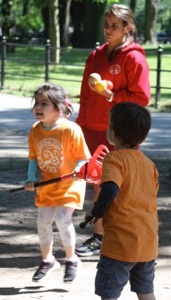 From there we walk (or skip or hop...) in to the sand volleyball court area near the Sheep Meadow for our activities. During the Winter Season, indoor venues may be available. For further description, see the Summer Program page.